4 bedroom villa with salt water swimming pool set in a tranquil area just 5 minutes’ drive from Ourique. 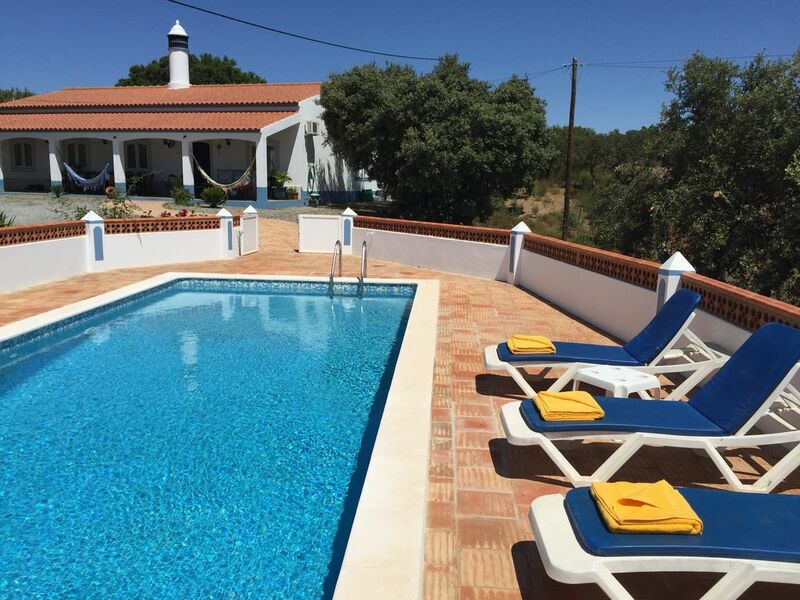 Vale da Nora de Baixo Country House is a traditionally styled villa which is divided into 4 bedrooms, one being ensuite, living area, fully fitted kitchen and 2 bathrooms. All the bedrooms are fitted with queen double beds. The living area includes lounge seating for up to 6 people with TV/DVD/Apple TV including some English speaking channels. There is a WI-FI connection for basic e-mails. The kitchen has a large granite table for 8 and is fully fitted with a cooker, microwave and fridge plus all necessary utensils. The covered terrace outside is perfect for “Al Fresco” dining with tables and chairs. There are also a couple of hamacs for those perfect afternoon or early evening “Siestas”. There is a large BBQ and the Salt Water Pool 9x4 metres is locked for those little ones without supervision. The town of Ourique is only 6km away with a good selection of supermarkets, shops, banks, restaurants, cafes etc. There is also Aldeia de Palheiros and Castro da Cola for a visit of the very traditional Alentejo. The Algarve is only 45 minutes away by car and this region does not need any presentation. Lisbon can be reached a mere 1 hour and half via Motorway. There is a train station called Funcheira which is 20 minutes’ drive and can take you to Lisbon or the Algarve for the day with a fast intercity train. The beautiful Alentejo west coast is less than 1 hour… Well worth a visit. There are local companies who provide various adventurous days, like fishing, bike ride, horse ride. We live in an annex close by the property. So if you need anything, just ask. We will be in the background, if you don't. Inverter for warming (we were there in februari). The owners are very nice!